One material property that is widely used and recognized is the strength of a material. But what does the word "strength" mean? "Strength" can have many meanings, so let us take a closer look at what is meant by the strength of a material. 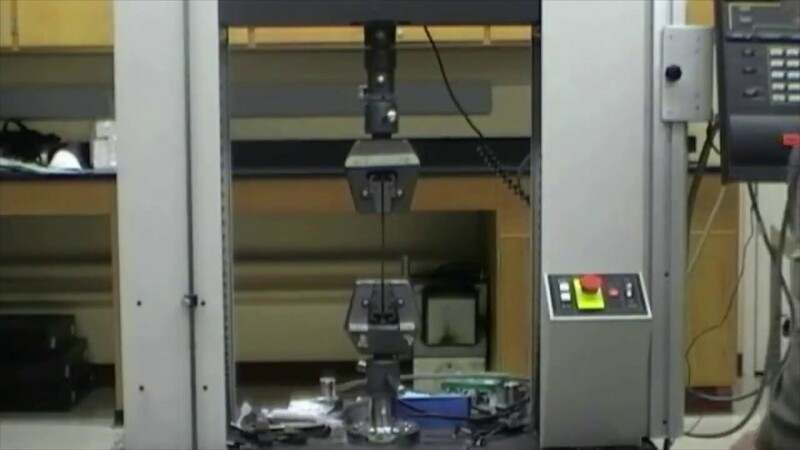 We will look at a very easy experiment that provides lots of information about the strength or the mechanical behavior of a material, called the tensile test. The basic idea of a tensile test is to place a sample of a material between two fixtures called "grips" which clamp the material. The material has known dimensions, like length and cross-sectional area. We then begin to apply weight to the material gripped at one end while the other end is fixed. We keep increasing the weight (often called the load or force) while at the same time measuring the change in length of the sample. One can do a very simplified test at home. If you have a way to hang one end of some material from a solid point that does not move, then you can hang weights on the other end. Measure the change in length while adding weight until the part begins to stretch and finally breaks. The result of this test is a graph of load (amount of weight) versus displacement (amount it stretched). Since the amount of weight needed to stretch the material depends on the size of the material (and of course the properties of the material), comparison between materials can be very challenging. The ability to make a proper comparison can be very important to someone designing for structural applications where the material must withstand certain forces. We need a way of directly being able to compare different materials, making the “strength” we report independent of the size of the material. We can do that by simply dividing the load applied to the material (the weight or force) by the initial cross-sectional area. We also divide the amount it moves (displacement) by the initial length of the material. This creates what material scientists refer to as engineering stress (load divided by the initial cross-sectional area) and engineering strain (displacement divided by initial length). By looking at the engineering stress-strain response of a material we can compare the strength of different materials, independently of their sizes. To use the stress-strain response for designing structures, we can divide the load we want by the engineering stress to determine the cross-sectional area needed to be able to hold that load. For example, a 1/8” diameter 4340 steel wire can hold a small car. Again, it is not always that simple. We need to understand the different meanings of “strength” or engineering stress. Now it gets more complicated. Let us take a look at what is meant by the different strength values and also look at other important properties we can get from this simple test. The easiest way is to examine a graph of engineering stress versus engineering strain. Shown below is a graph of a tensile test for a common steel threaded rod, providing a good example of a general metal tensile test. The units of engineering stress are ksi, which stands for a thousand pounds per square inch. Note the reference to area in the units. The units on strain are of course unitless, since we are dividing distance by distance. Let us discuss some of the important areas of the graph. First, the point on the graph labeled number 1 indicates the end of the elastic region of the curve. Up to this point, the material stretches in an elastic or reversible manner. All materials are made up of a collection of atoms. Elasticity can be best understood by imaging the atoms are connected by springs. As we pull on the material, the springs between the atoms get longer and the material lengthens. The elastic portion of the curve is a straight line. A straight line indicates that the material will go back to its original shape when the load is removed. The next portion of the curve of interest is point 2. At this point the curve has begun to bend over, or is no longer linear. This point is known as the 0.2% offset yield strength. It indicates the strength of the material just as it starts to permanently change shape. It is determined as the value of the stress at which a line of the same slope as the initial portion (elastic region) of the curve that is offset by a strain of 0.2% or a value of 0.002 strain intersects the curve. In our example, the 0.2% offset yield strength is a 88 ksi. This is a very important aspect of strength. It basically tells us the amount of stress we can apply before the material starts to permanently change shape, putting it on a path to eventual failure. Those who design parts that are used under stress must see that the stress or force on the part never exceeds this value. As we move up from point 2 the load or "stress" on the material increases until we reach a maximum applied stress, while the material deforms or changes shape uniformly along the entire gauge length. When we reach point 3, we can determine the tensile strength or maximum stress (or load) the material can support. It is not a very useful property, since the material has permanently deformed at this point. After we reach this point, the stress begins to curve drastically downward. This corresponds to localized deformation, which is observed by a noticeable “necking” or reduction in the diameter and corresponding cross-section of the sample within a very small region. If we release the load in this area, the material will spring back a little but will still suffer a permanent shape change. Finally, as we follow the curve we eventually reach a point where the material breaks or fails. Of interest here is the final degree to which the material changes shape. This is the “ductility” of the material. It is determined by the intersection of line number 4, having the same slope as the linear portion of the curve, with the strain axis. Our example shows a strain of 0.15. The 15% change in length is the amount of “ductility”. When the sample fractures or breaks the load is released. Therefore, the atoms elastically stretched will return to their non-loaded positions. Other information about the mechanical response of a material can also be gathered from a fracture test. If one pulls on a material until it breaks, one can find out lots of information about the various strengths and mechanical behaviors of a material. In this virtual experiment we will examine the tensile behavior of three different composite fiber materials. They have similar uses but very different properties. A material is gripped at both ends by an apparatus, which slowly pulls lengthwise on the piece until it fractures. The pulling force is called a load, which is plotted against the material length change, or displacement. The load is converted to a stress value and the displacement is converted to a strain value. All of these composites use epoxy as a matrix, which “glues” the fabric like arrangement of the fibers of the respective materials. Epoxies are thermosetting network polymers, which are very hard and strong, but on the brittle side. All fabrics are of the same “weight,” which is a measure of fabric size or weight of a square yard. An example of the fiber material made from fiberglass is shown above left. Kevlar is very similar except it has a yellow color. The carbon has a black color. The samples used in this case are flat bars cut out of larger material using a water jet saw. The three samples are shown below left. Description: The apparatus pulls on each end of the material until it fractures. The video is 5 minutes and 5 seconds with no audio. The carbon fiber composite material has a much higher tensile strength and modulus of elasticity than the other materials. Note they all break in a “brittle” manner, as the curve is linear until it breaks or fractures with no bending of the curve at high loads. Consequently, there is no permanent change in original shape during this test, and hence no ductility. You have seen the experiments for the composite materials. Compare the composite material stress-strain curves with those for polymer and steel. Below are optical photos of the broken or fractured samples, along with close ups of the fracture surface, taken with a scanning electron microscope. Study of these fracture surfaces is also a very important part of materials science and engineering, making this an area of specialty.